Fourteen years after the debut of the existing XT600E in 1990, the XT660R makes its appearance as a completely remade model for the 2004 European market. 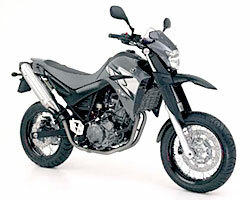 While continuing the original product concept of the XT600E, the new model has been developed to embody the key words The New Legend Crossover Trail 660 by offering (1) running performance for easy around-town riding, (2) high-speed cruising capability for enjoyable expressway cruising, (3) innovative new styling and (4) environment-friendly performance. The key elements for bringing out optimum performance from the liquid-cooled 4-stroke, SOHC single-cylinder, 660cc 4-valve engine is the new fuel injection FI system and the roller type rocker arm valve-lift mechanism. On this roller type rocker arm, the slipper is given a needle roller bearing that gives the slipper a constant revolving motion that reduces the friction resistance with the cam while also providing excellent reliability, great power feeling in the low to middle speed range and excellent emissions qualities. Whats more, the combined effect of the re-positioning of the crank, main and drive axes, a compact crankcase and optimized flywheel mass (20% less than the XT600E) help achieve excellent power output characteristics. Meanwhile, the new-design frame and a rich array of features like a front fork with 43mm diameter inner tubes, a bottom link type rear suspension with 5-step adjustment mechanism, a floating mount front disc brake with 298mm disc and straight-spoke wheels ensure dependable riding performance. Also, the front-back two-piece fender, emphasizes a new type of on-off model styling. 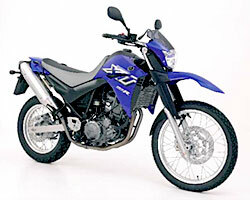 The XT660X variation model recreates the excitement of the world of Super Motard so popular in Europe and other markets. With features like a front brake combining a 320mm disc with 4-pot caliper, special outer tubes for the front fork and special tires (front: 120/70-17 with 3.50 rim, rear: 160/60-17 with 4.25 rim), special-design handlebars and seat, this model expands the world of XT performance. This is another new 2004 European market model that debuted at the 2003 Milano Show. 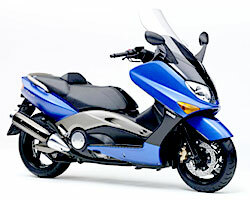 While maintaining the same basic model concept that has made the TMAX so popular as a high-speed sport commuter, the new XP500 TMAX features boosted performance with the adoption of (1) increased engine power output, (2) adoption of a fuel injection FI system, (3) larger 41mm front fork, (4) radial tires front and rear with a larger rear tire size and (5) a double disc front brake. Other additions boost functionality, like a key-integrated immobilizer, a new-design meter panel and a parking brake function. One of the key features that brings out even higher levels of performance on this model is a fuel injection FI system with an especially fine atomizing injector. Also, to accommodate the new FI system, the specs of the pistons and connecting rods have been changed and the compression ratio altered from the existing 10.1: 1 to 10.9: 1. The V-belt spec has also been changed to ensure greater reliability. On the chassis, the inner tubes of the front fork have been increased in size from 38mm diameter to 41mm and a new double-disc front brake is adopted for even more stopping power. The adoption of radial tires front and rear has been another important factor contributing to this models excellent drivability. The combined effect of these improvements to the engine and chassis specs make this a model with boosted high-speed running performance and improved power development in the low- to mid-speed range for an even sportier ride.